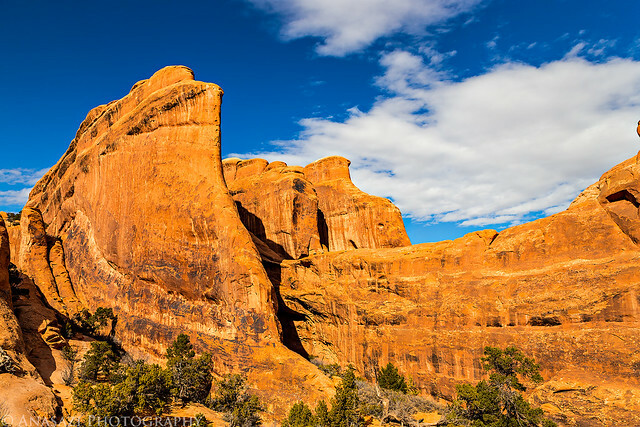 For the long President’s Day weekend, Diane and I decided to spend the weekend around Moab. We had booked a hotel room a few weeks earlier and had no idea how nice the temperature would be this weekend. 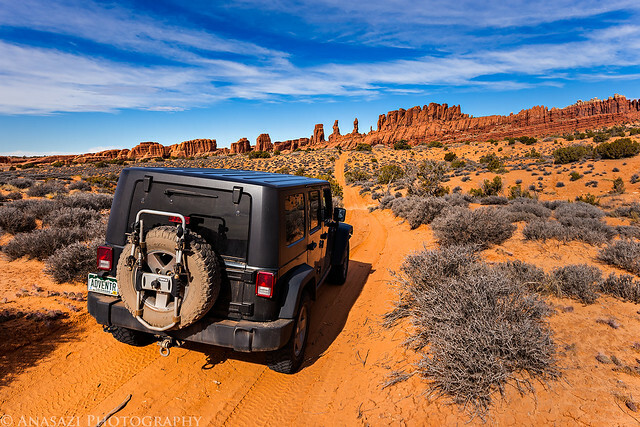 Unfortunately, thanks to the three-day holiday weekend and warm weather, Moab was a bit busier than it normally is this time of the year. 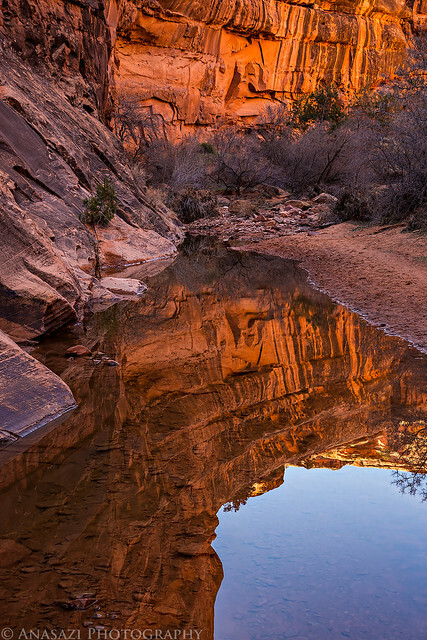 We left home early Saturday morning and headed right for the Hell’s Revenge Trail in the Sand Flats Recreation Area. I have driven this trail numerous times in different Jeeps, but this would be Diane’s first experience on a real Jeep trail. 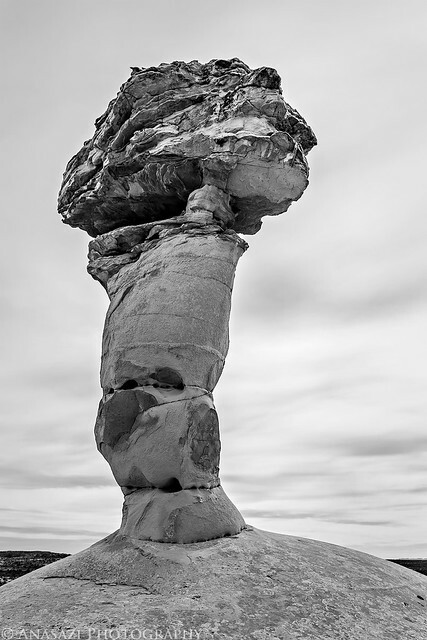 The sky was overcast all day, so I didn’t take too many photos while we were on the trail. After completing Hell’s Revenge we also checked out part of the Fins & Things trail before heading back into town for a burger from Milt’s for a late lunch. 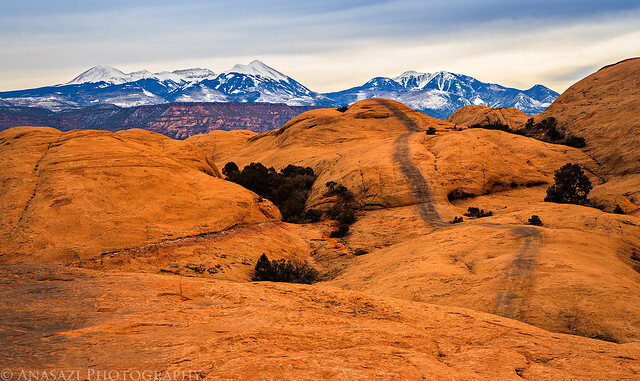 Black tire tracks mark the trail across the sandstone with the La Sal Mountains in the distance. 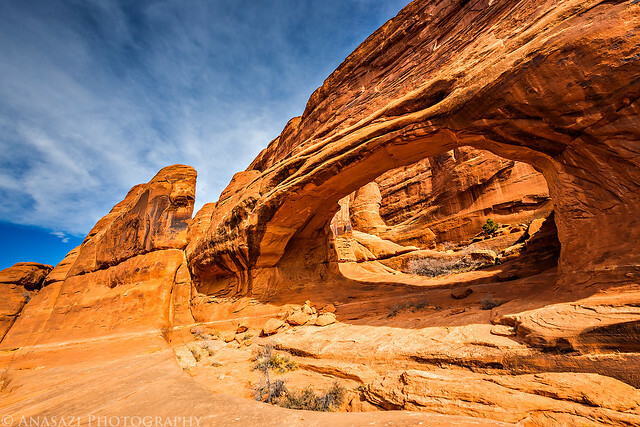 After lunch we followed the Colorado River to Kane Creek Canyon and climbed up a break in the cliff to visit Funnel Arch. 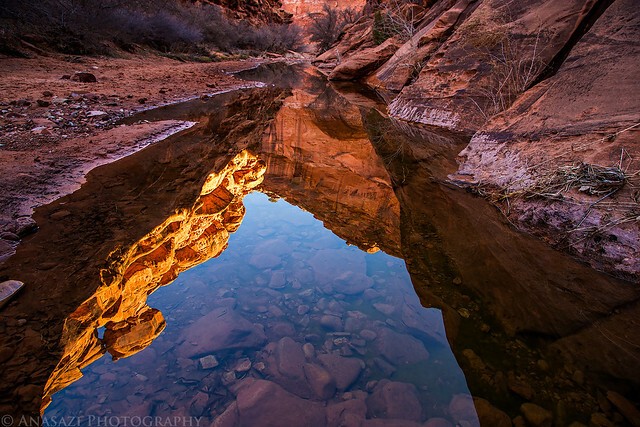 A view of the Colorado River from near Funnel Arch. Funnel Arch on an overcast afternoon with the sun just barely visible through the gray sky. 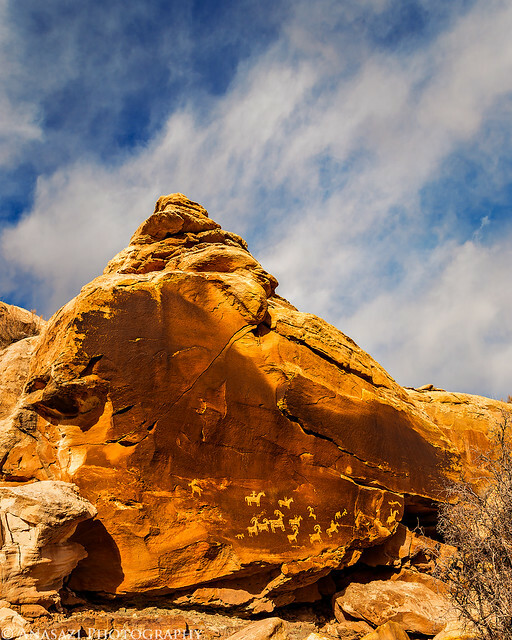 When we climbed back down from Funnel Arch we stopped at Birthing Rock to check out the petroglyphs. Then we climbed up Petroglyph Canyon to view many other petroglyphs. 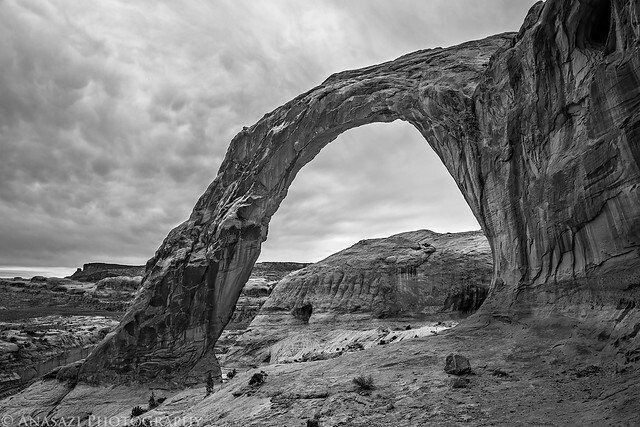 Corona Arch in black and white showing off the mammatus clouds above. Driving towards the Marching Men and Klondike Bluffs on our way to Tower Arch. 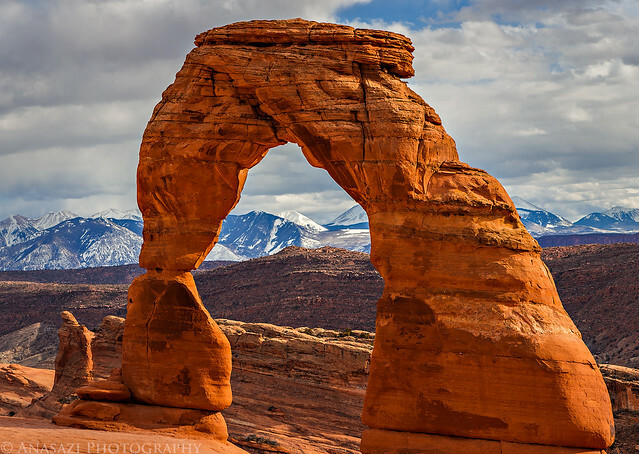 As we drove from Eye of the Whale to Tower Arch the overcast sky finally started to clear up a little. 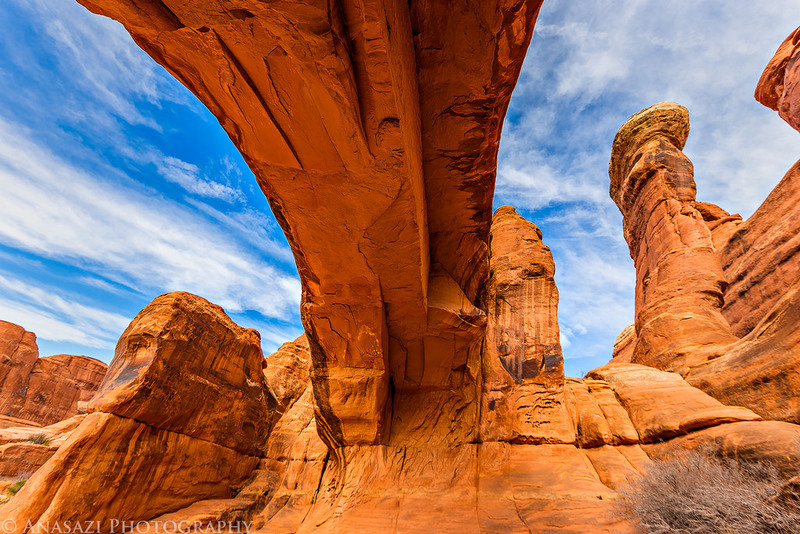 A different view under Tower Arch. 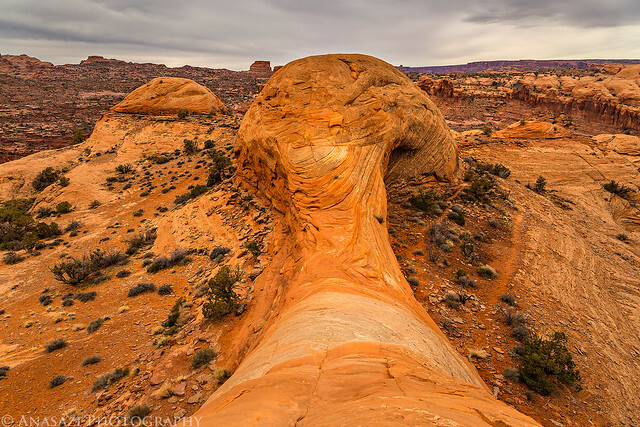 When we reached Salt Valley we joined back up with the main road through the park and stopped at Devil’s Garden so we could take the quick hike to Landscape Arch. This trail was pretty busy for February, but certainly not the busiest I have seen it. 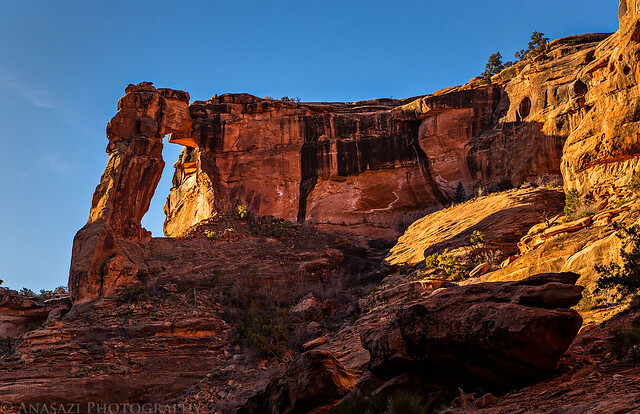 I didn’t like the light on Landscape Arch while we were there, but these fins in the other direction looked nice. A storm in the distance as we hiked back down from the arch. 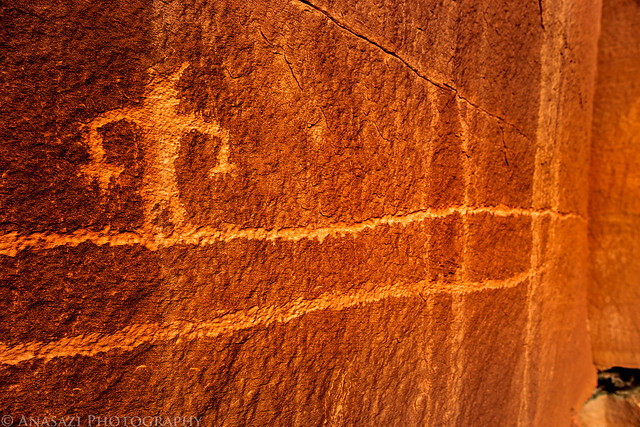 We stopped to visit the Ute petroglyphs near the Wolfe Ranch. As we drove out of the park I pulled over for a quick photo of this dusty scene. 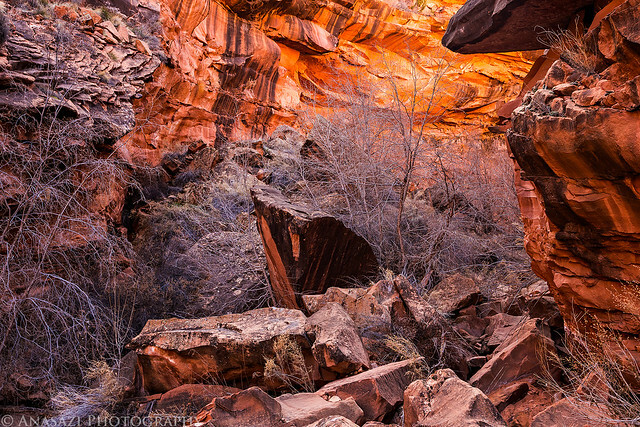 On Sunday morning we returned back to Kane Creek Canyon so we could take a nice relaxing hike through Hunter Canyon. We got an early start and took our time on this hike and still didn’t run into anyone else in the canyon until we were on our way back out. It was a beautiful hike and the morning light was pretty nice, too. 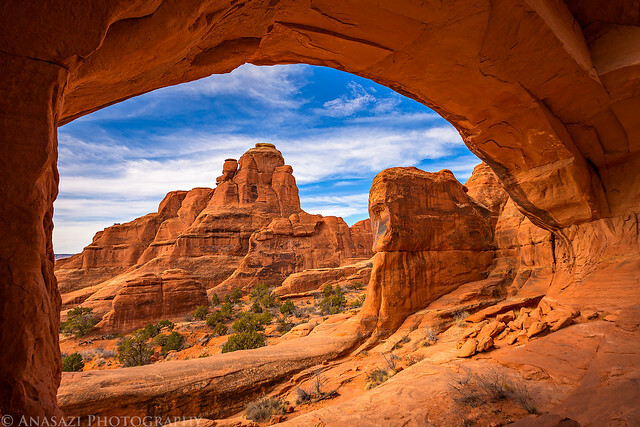 Near the beginning of the hike we passed under Hunter Arch. 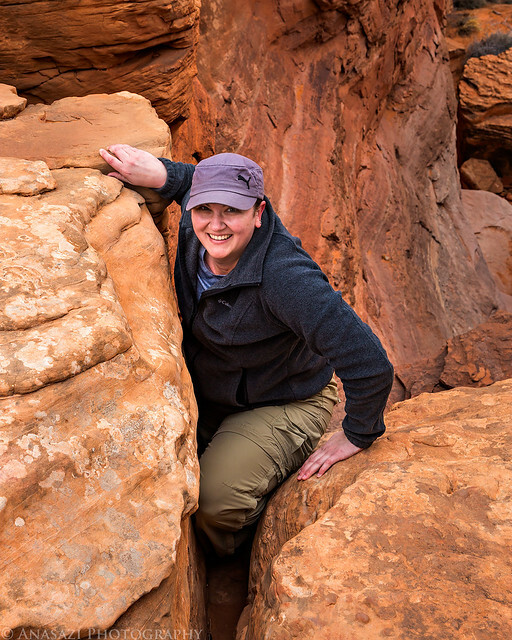 Diane explores under a large boulder that had some nice reflected light going on. 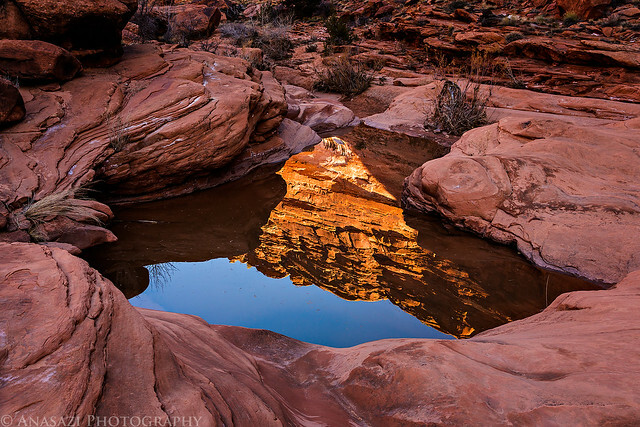 There was water running through the canyon so there were a lot of opportunities for reflection photos. 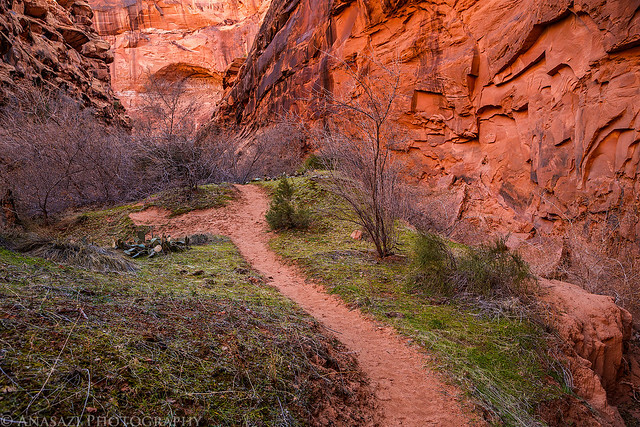 Following the trail through the canyon. 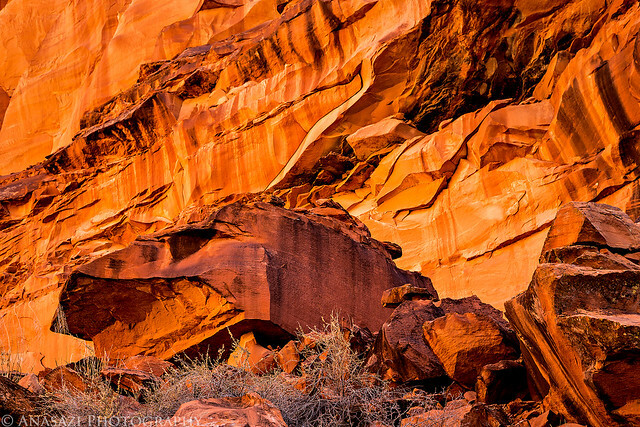 Intense reflected light on the sandstone above. We followed the light around this bend by hopping over large boulder to find a small pour-over that had a little waterfall. Hiking back out in full sunlight. On our way back home we stopped to check out the Intestine Man and TV Sheep. Then we visited Secret Spire. 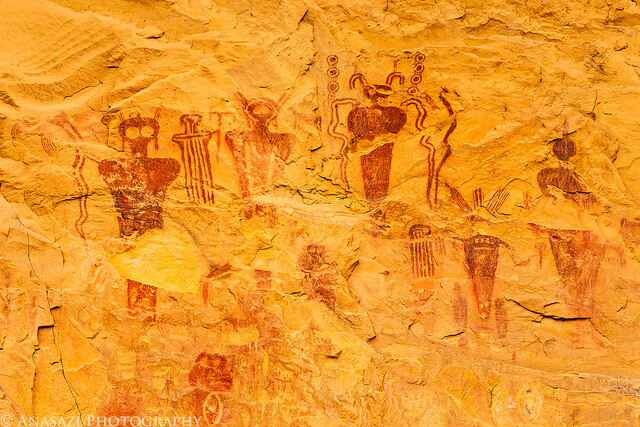 We made one last stop at the Sego Rock Art site in the Book Cliffs.